Got ya! said Mark, looking up at me from the monitor with a satisfied smile, see there: fit as a fiddle, this one. Nice-looking, too. He rewound and then played back the CCTV footage of the shopping centre car park for me. The grainy black and white video revealed a Nissan Micra with two passengers in the front proceeding rather rapidly past the ranks of parked cars. There were spaces near the far end, but closer to the building the vehicles formed an impenetrable barrier, where they lined up mutely like a Roman cohort. 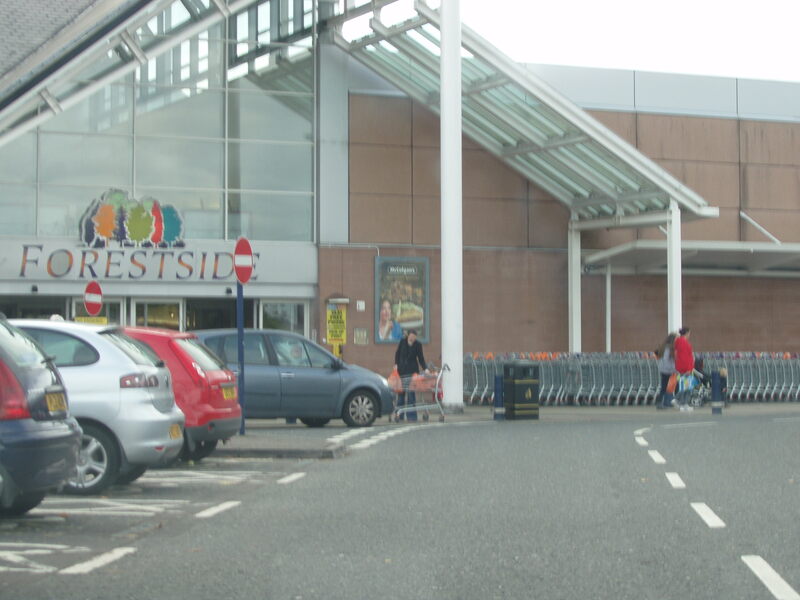 The Micra nipped into the disabled space nearest to the entrance, and a slim young woman jumped out and strode briskly across the glistening tarmac towards the supermarket. It all happened very quickly. C’mon, Mark said enthusiastically, let’s go and have a look. Bet you a tenner there’s no blue badge. Get the rest of this clamp, will ya? We would often have a wee wager, but this time I didn’t accept: it looked like a cert. We each lifted a part of the heavy yellow wheel-clamp, donned our high-vis jackets and went out into the winter sunshine. The glare from the asphalt was blinding, forcing me to squint like a gun-slinging sheriff. Why do I never think of wearing my Ray-Bans in winter? I reproached myself. When Mark knocked on the passenger window, the young man in the front looked up nervously and then slowly wound it down. He had straight, fair hair that hung down to his collar, and a scruffy beard. His striking blue eyes were red-rimmed and sunk into dark hollows, underscored by purple-black bags. He wore a battered Aran jumper, which had the remains of an unsuccessfully-removed gravy stain on the front. Stoner, I thought to myself, Mark won’t like that. Think his daughter went out with a hippy once; drove him mad. This should be fun. Mark’s voice was firm: Good morning sir, he began. Good morning, officer, the hippy answered. I nearly chuckled out loud at that, and I knew Mark would be laughing inwardly too. We love it when the punters think we’re cops. Are you disabled, sir? Mark continued, I don’t see a blue badge. The young man stared at his feet, then replied, No, I’m afraid not. This was getting better and better. I was mentally urging Mark to have a bit of sport with this guy; he could easily tie him in knots. But he didn’t go down that path. Instead he simply asked, And is your girlfriend disabled? The hippy knew he was done. He looked up and shook his head resignedly, then started to plead: We only stopped to get bread, officer, two minutes. We’re just waiting here, not really parked. I can move the car if someone needs the space. Mark smiled kindly at him and said, It’s OK son, we’re not the police, then delivered the knockout: but you can’t wait here. I’m going to have to clamp you. See the sign there? This is for disabled people. It’s not fair of you to take it; there are plenty of spaces back there. He pointed towards the far end. A wee walk wouldn’t kill you now, would it? The guy looked crestfallen, nodded, and mumbled, We can’t afford to pay £50, it’s a disaster. Mark smiled again sympathetically, and said reassuringly, I know, son. It’s tough. But maybe you’ve learned your lesson here, eh? Nothing I can do, you’re on CCTV and everything. He gestured to me, and I moved round to the driver’s side and started assembling the clamp on the front wheel. The first thing I knew of her was a light footstep behind me. As I turned and stood up I caught a whiff of perfume. She was tall, with bobbed black hair, red lipstick. She looked classy, wearing a long felt coat, leather trousers, and boots. A thought got stuck in my head: what the hell is she doing with that scruffy loser in the front? It seemed like I’d been standing there dumbstruck for ages before she spoke, but it was probably only a split second. What’s the problem? She enquired coolly. Mark took the initiative, as usual, and said authoritatively, You’re parked in a disabled spot, I have to clamp you. Your boyfriend has confirmed that neither of you is disabled. If you pay now I’ll release you right away. She sighed, fixed Mark with her deep green eyes and answered, But we were only here to get a loaf of bread. My boyfriend would have moved the car if anyone had come along. There’s nowhere to park here, and we were only going to be a little while. If you let us go we’ll never do it again, I promise. Mark was used to this sort of chat; I knew he would stand firm, and he did; refused her point blank: If I let you go, then I have to let everyone go, he said calmly; the law’s the law. Just pay the fine and you can leave. She hesitated for a moment, and then I saw them: twin rivulets, trailing black mascara down her cheeks. The sobbing followed, quietly at first, then louder. Mark looked embarrassed and perplexed. An old couple pulled into the space opposite. I instinctively checked for the blue disabled badge. Please, she said brokenly, we can’t afford this; we have no money, and we have to go to my grandmother’s funeral tomorrow. If we pay this fine we won’t be able to go. Please make an exception for us, this one time. We’ll never do it again. Mark cleared his throat and said thickly, Alright, but don’t do it again. I could swear he was welling up himself. He motioned to me to remove the clamp, totally oblivious to my reproving look. Thank you so much, she said warmly, we’ll never do it again. I lifted the clamp segments away and moved aside to let her get in the car. In the driver’s seat she pulled a tissue from her handbag and dabbed at her eyes, then took another and blew her nose. Her boyfriend was staring at her with a look of incredulity on his face. I couldn’t hear what he said to her. She reached once more into her bag, took out a cigarette and lit it with a disposable lighter. Then she quickly started the engine, wound down her window and started to reverse out of the parking space. I caught one last look at her as she moved out into the car park. No mistake: she gave me a barely perceptible wink, then burst out laughing. This entry was posted in Uncategorized and tagged Belfast, CCTV, disabled parking, fake tears, hippy, Jason O'Rourke, Literature, performance, running mascara, short story, sport, stoner, Supermarket, sympathy, trickery, Wheel Clamp, WPLongform, writing. Bookmark the permalink. Thanks for your comment Ernie. I should maybe try to write a story with a wheel-clamper or traffic-warden as a sympathetic character… this one was all about the way the woman easily manipulated the man.